An audiobook collection of history and stories from Route 66. Hear from the mom and pop shops from Route 66's hey day. Learn about the diners, gas stations and tourist courts. Travel Route 66 in this audio adventure, then take a drive and discover America's Main Street for yourself! 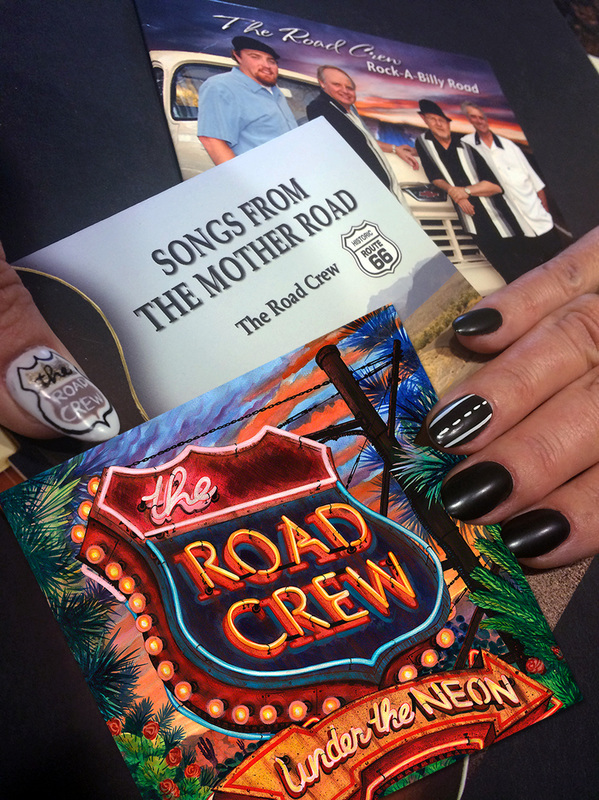 Enjoy 'Songs From The Mother Road" from America's favorite Route 66 band, The Road Crew! The band was honored with the Bobby Troup Award of Artistic Recognition by the International Route 66 Association. Their "Rock-A-Billy Road" CD was introduced at the 2011 Route 66 festival in Amarillo." Their music will give you the bug to hit the old highway! The Road Crew - America's Route 66 Band! Take a trip down memory lane. See what Route 66 once was during its hey day! Over three hours of captivating stories and events on the days of Route 66! CD#1 America's Main Street - For three generations of travelers, Route 66 was the highway that linked America together. It was the mother road, and there was never another like it. Hear the stories of the tourists, the Okies, the wartime GI's, the people who ran the tourist courts and cafes…the famous and infamous. Pure nostalgia. CD#2 Roadside Marvels - There’s snow in Flagstaff and a blazing hot sun in the Mojave. There’s history in the Land Of Lincoln; a cave in Missouri, Indian jewelry in New Mexico, a jackalope in Arizona and the Santa Monica Pier at the end of the trail. From Grant Park in Chicago to the Pacific Ocean, for twenty two hundred and seventy eight miles, Route 66 wound its way through eight states. The old road has seen it all. CD#3 Roadside Marvels - In the first days of Route 66, when the road was being built in bits and pieces, there was little time for sight-seeing. Just getting from one place to another was hard enough. As the road improved, so did cars. Tires were better and it was not unusual to drive a thousand miles without a flat or a breakdown. Now, people were willing to get off the main road and venture down mysterious little side-roads leading into strange little villages. Listen as Readio Theatre takes you off the beaten path, just a few miles from Route 66. - Narrated by Don King of The Road Crew - America's Route 66 Band. A wonderful collection of songs paying tribute to the sites and the people along Route 66, the world’s most famous highway. The variety of musical styles includes folk, country, blues, western swing and even a touch of surfer pop. From the pen of hit songwriter, Woody Bomar, comes these tunes inspired and born on The Mother Road. Woody has composed music for Loretta Lynn, Conway Twitty, Jim Glaser, Hank Williams, Jr., Lynn Anderson, Lee Greenwood, T.G. Shepperd, Rhonda Vincent and others. “I love the road and I love the people all along the way,” says Woody. “This Project is a total labor of love.” The energy of this music is so contagious! Performed by The Road Crew, featuring former CBS Records Artist Don King. “You just can’t sing these songs and not feel the spirit of the old road under your feet,” said Don. In tribute to the late Bobby Troup, The Road Crew adds their flavor to his classic hit “(Get Your Kicks On) Route 66” as a special bonus track. A fun and upbeat collection of songs enjoyed by the boomer generation and young people searching for a piece of Americana. Re-discover the hits from Buddy Holly, Rick Nelson, Elvis, Carl Perkins and Bobby Darin. This high powered CD will lift your spirits and start your day just right! You’ll also find a couple of nugets of gold in two tunes penned by the band. While residing in Nashville, TN, The Road Crew performs on Route 66 each year. In tribute to the late Bobby Troop, The Road Crew adds their rockabilly flavor to his classic hit “(Get Your Kicks On) Route 66” as a special bonus track. Left to right: Jason Harmon, Don King, presenter: Michael Wallace, Woody Bomar and Joe Loesch. The Road Crew - Winners of the Bobby Troup Award of Artistic Recognition, presented by the International Route 66 Association in Amarillo, Texas 2011. Enjoy our new original songs about America's Main Street, Route 66. We love this old highway and everything it represents. Pile your family in the car and give them an actual sense of America's past by introducing them to the people, places and things along The Mother Road. While you're at it, set the scene with these tunes to help you set your time machine on course. The band released this CD at The Birthplace Of Route 66 Festival in Springfield, MO. Celebrate Route 66 with us, "UNDER THE NEON"!